Welcome to the most unique assembly program you will see this year. 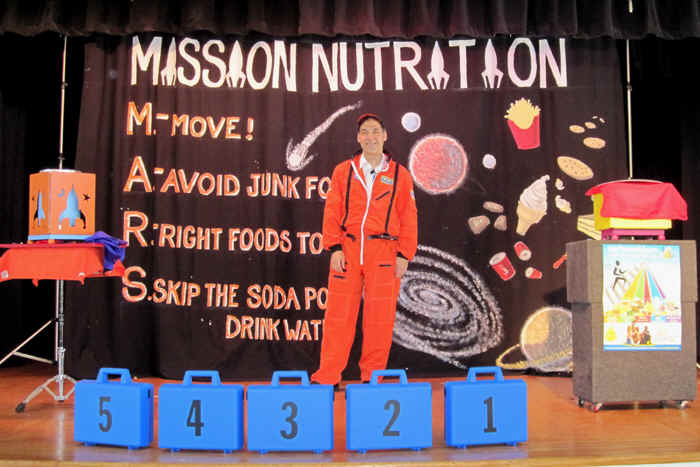 It will motivate and inspire your students to make healthy eating and living choices, all while taking a fun-filled and magical trip to the planet MARS. 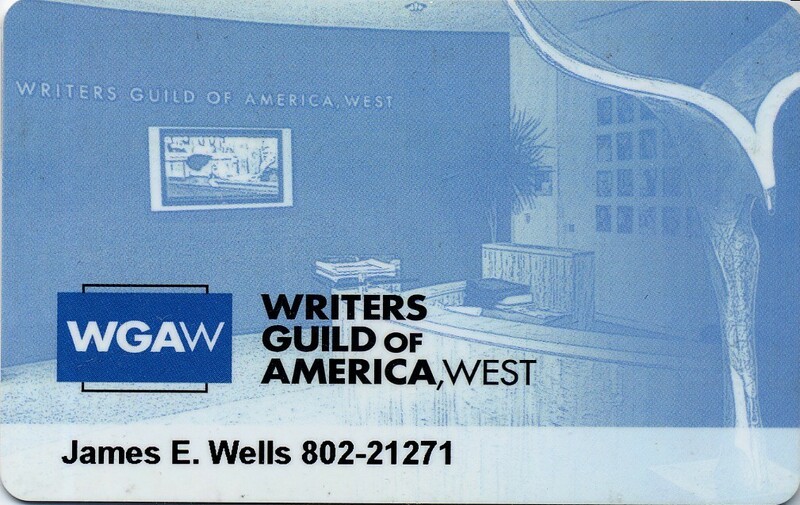 To introduce myself: I am a professional school assembly presenter, a California credentialed teacher, a published author and a member of the Writer’s Guild of America. 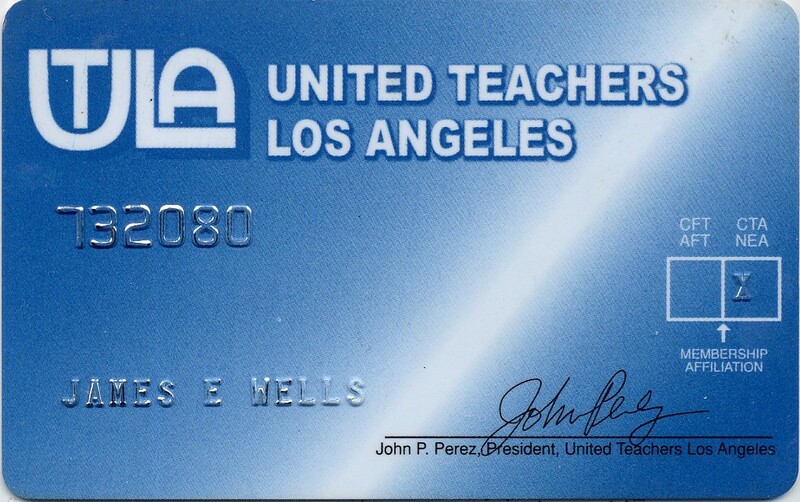 I hold a BA and a Master's degree from UCLA. 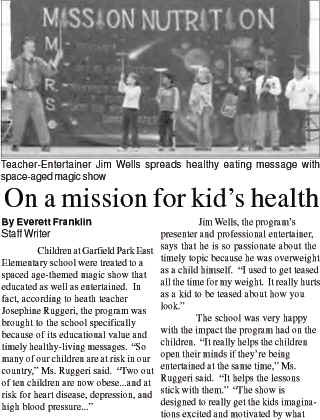 I have used that experience and education to create an assembly program that is so compelling that it will empower your students with strategies to improve their physical and mental health for a lifetime. But the kids aren’t the only ones who are inspired by this fun and exciting program. Your staff will also love how educationally significant the show is, how wholeheartedly your students embrace its vital lessons, and how well it fits your curriculum and stays within your budget! "My students absolutely loved your performance. Your energy and excitement were contagious and the students discussed the content enthusiastically, following the assembly. I believe your message reached them: take care of yourself, make healthy choices. 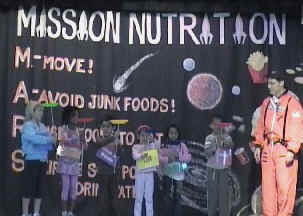 Science is a high interest subject, therefore, combining it with nutrition, made a strong bridge to their daily interests. My students’ (5th grade) attention was held and they really wanted to figure out your magic! Superb job!" I am also a father and uncle of elementary-aged children and our children are at risk. 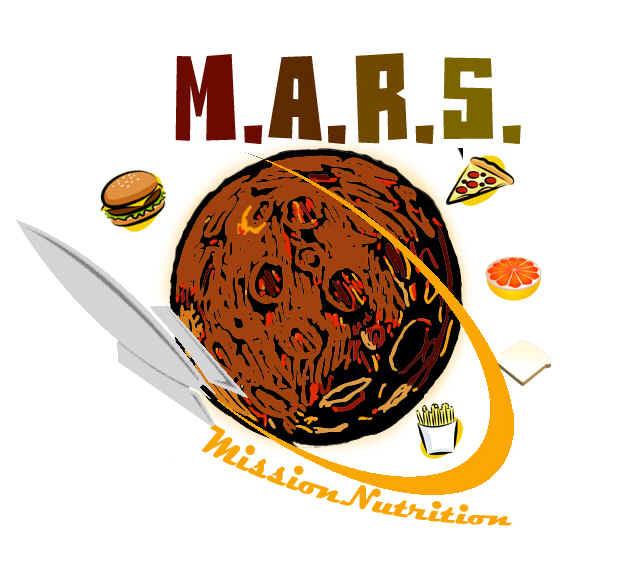 My passion for Mission: Nutrition is a function of the urgency of its subject matter. Okay, Jim, What Makes the Assembly Such a Hit? 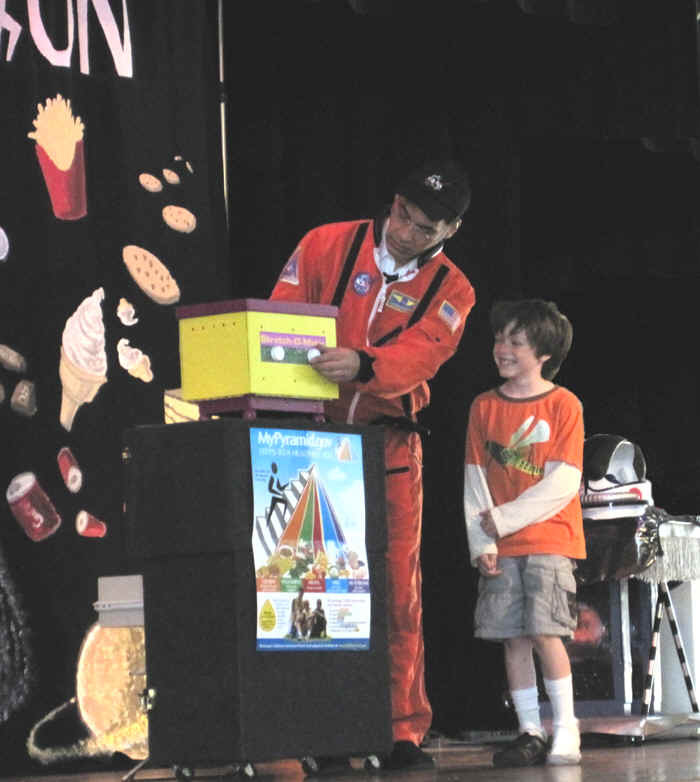 Hilarious comedy, powerful magic, music, flashy gear, and student participation on stage—these combine to capture the childrens' imaginations as we journey through outer space to the planet Mars. 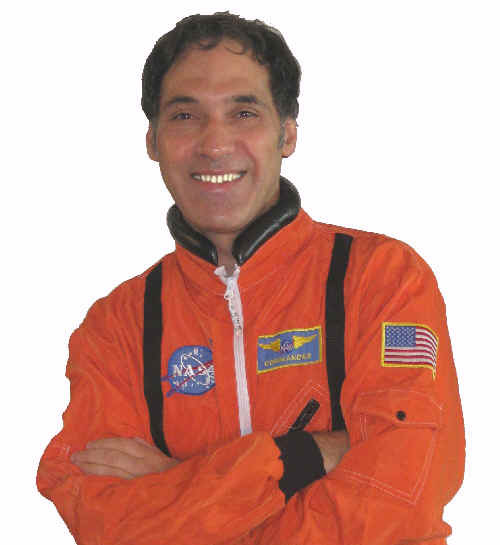 "(I best liked the) weaving of humor and great information to form a magical presentation. 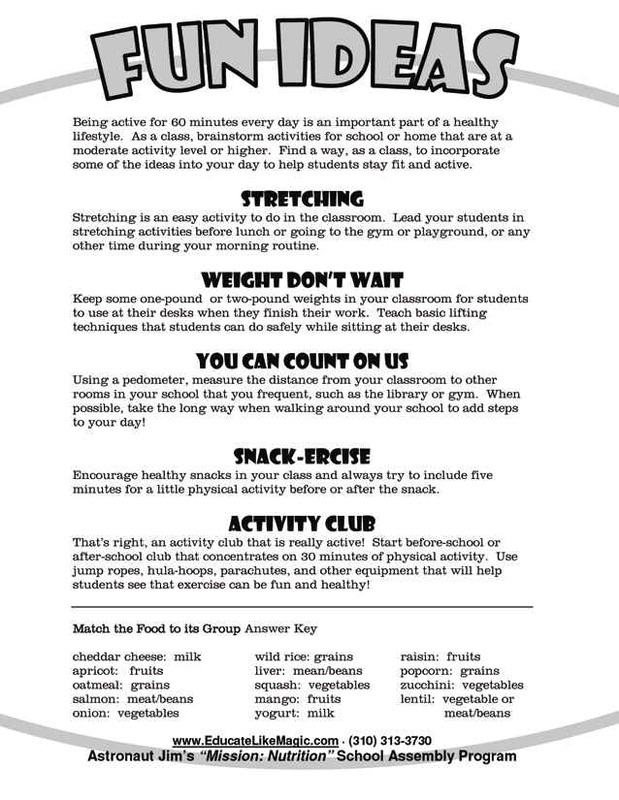 Lots of informative "chunks" of healthy things to know and grow." 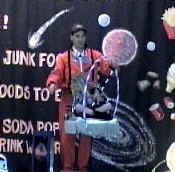 Watch out for the asteroid belt of junk food! 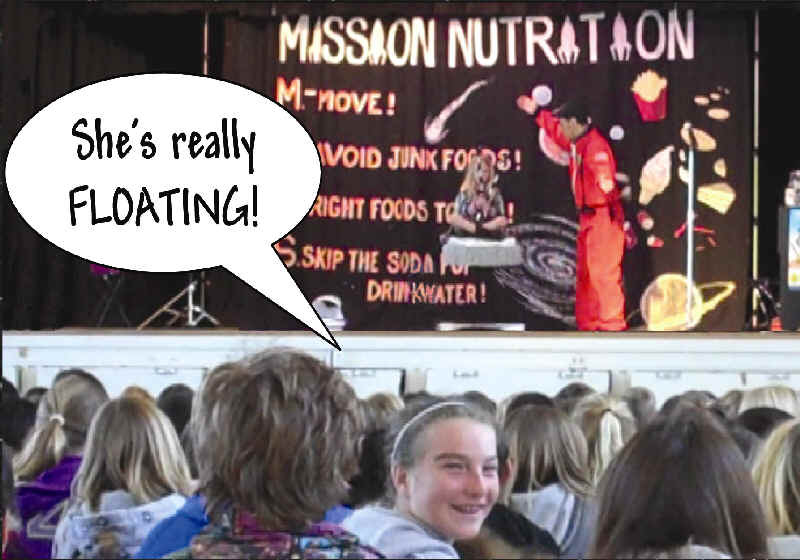 The laws of gravity are repealed and anything goes: an exercise jump rope gets cut and restored, root beer changes to water, a student’s sneaker disappears and reappears in a lunch box at the other side of the stage! 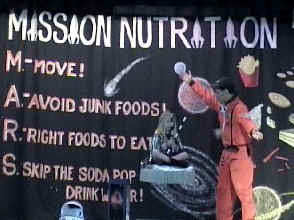 "A great show that taught the basics about nutrition in a fun way that kept the students engaged and interested. 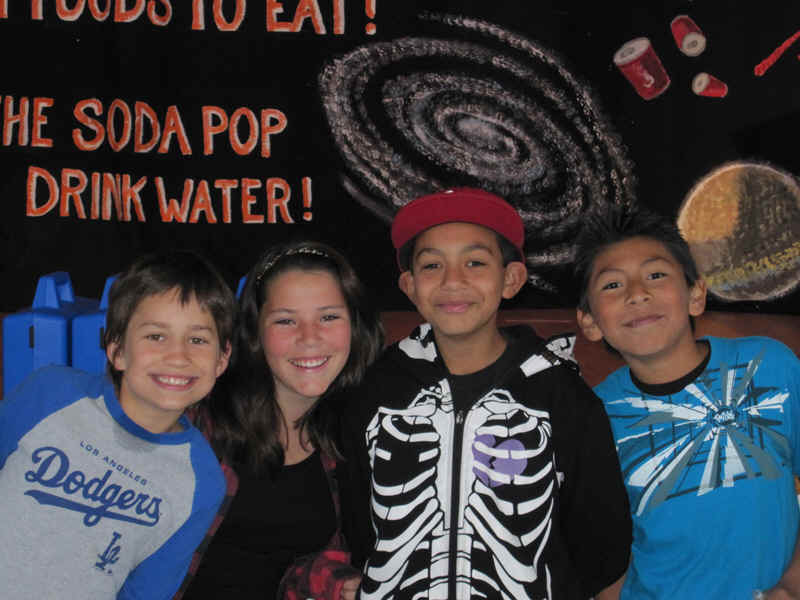 The magic tricks really held the student's attention and having student's participate makes it more fun." As the big finale, a student actually floats in midair just as if they were weightless in outer space! I will pass a hoop around them to prove it! 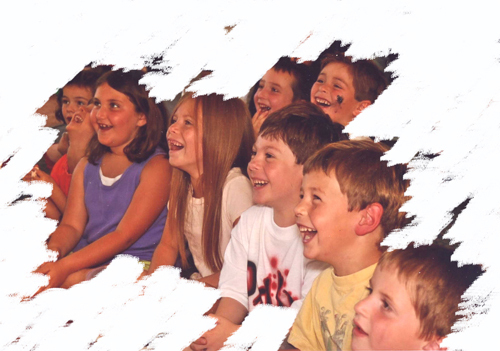 The high-octane entertainment insures the children embrace the curriculum that each routine teaches. Because I am a credentialed teacher and professional entertainer you can count on the students having a great time while they learn. "Engaged students while they learned. Educational fun at its finest!" "(The) magic and sound effects really helped to keep attention. 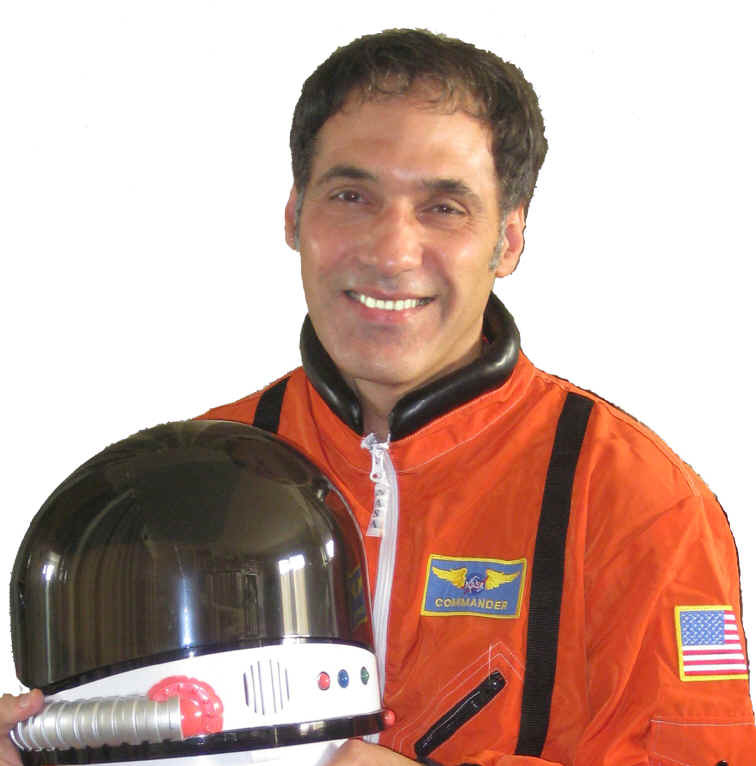 Interactive, good pace, engaging presentation, good content, excellent props." 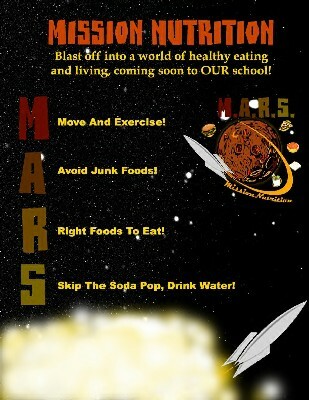 I developed the “M.A.R.S” acronym to make the lesson plan easy to remember. M – Move And Exercise! A – Avoid Junk Food! R – Right Foods To Eat! S – Skip The Soda Pop, Drink Water! 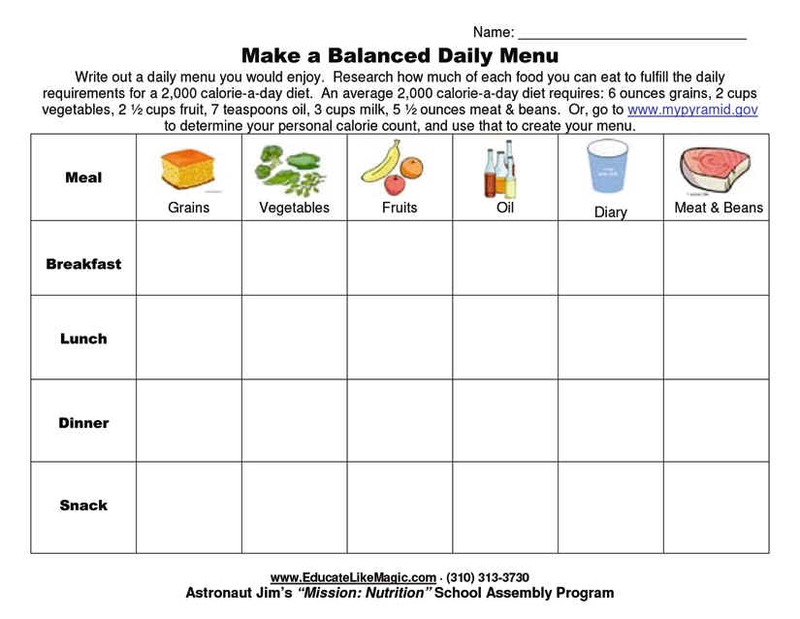 Ø The official “Mission: Nutrition” bookmark for every student! ABOVE: Even our huge backdrop is custom painted with our lesson plan to reinforce the learning throughout the presentation. 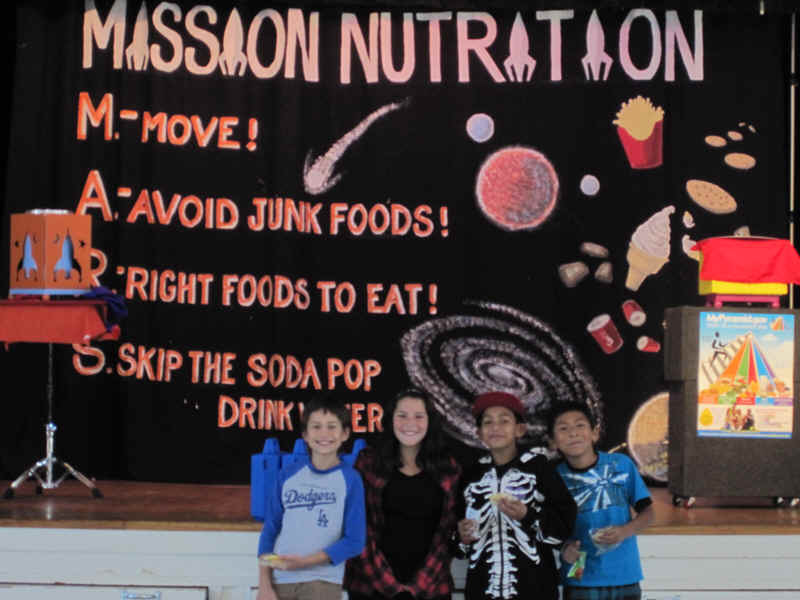 How Do We Bring Mission Nutrition To Our School? Simply pick up the phone and call our office at (310) 313-3730 or Email Jim@EducateLikeMagic.com for our very affordable pricing and availability. Discounts available! Other assembly presenters don't offer a guarantee this strong. We know you’ll never need to use it, but doesn’t it feel good to be protected?